CrossRail2 – ‘Euston St Pancras’ another new train station for the neighbourhood? And our old friends – rail engineering costs are also there – £15.7 to £19.7 billion. We shall be keeping a close eye on station costs as they emerge. Note that the working assumption is that the new Euston won’t be big enough. So where can they put this thing? I am guessing that it would be underground with tunnel walks/travellators to the three mainline stations (a bit like Bank). One assumes that they won’t dig under St Pancras or Kings Cross or Euston themselves. Nor under the British Library – which has a big underground book repository, nor under the infectious disease research place currently being built behind the BL. Which points to somewhere in between Ossulton Street and Eversholt Street. An area of high density social housing and some economic deprivation. I’ve sketched it out on a map. It’s kind of ironic that the recent HS2 Euston fiasco blighted people’s lives to the West of Euston and now Crossrail2 threatens the same for those East of Euston. UPDATE – following ‘concerned resident’ comment below the Police Garage on Drummond Crescent is this building. Living near Euston we have a problem, indeed. You can give your views to TfL in a simple online form here – you can insert somethign about the station in the open box at the bottom. This entry was posted in Big developments, Planning, Licensing and Regulation, Travel and tagged Euston St Pancras. Bookmark the permalink. 5 Responses to CrossRail2 – ‘Euston St Pancras’ another new train station for the neighbourhood? I don’t believe that anyone has argued that a Crossrail 2 ‘Euston St Pancras’ station would require a new surface building. The proposed amendments to the High-Speed 2, which also involve a ‘Euston-St Pancras’ station, do not involve a new surface building earlier (though the existing Euston might still be redeveloped but on a smaller, less destructive scale than the original plan). Rather, my understanding is that the existing KX-StP station is ‘Crossrail 2-ready’ in the same way that Tottenham Court Road is. It is similar to Farringdon, where the new Thameslink station is Crossrail 1-ready. The problem is with the underground facilities at the ‘Euston end’ of a E-KX-StP station, which are already at capacity and will need to be expanded anyway due to HS2. But expanding them need not require demolition above ground (though it possibly be easier if done concurrently with rebuidling Euston above ground). A letter from Cllr Sarah Hayward to the secretary of state (regarding a school displaced by HS2) indicates that one site under consideration for the ‘Euston St Pancras’ station is the Police Garage on Drummond Crescent. I doubt a surface station for Crossrail 2 has even crossed anyone’s mind at TfL. King’s Cross was rebuilt with CR2 in mind and Euston will be likewise, all that’s left is the funding to excavate the pair of running tunnels and connecting passages inbetween them – a useful side-effect would be a below-ground walking route between HS1 and HS2. The provision of an improved pedestrian link between Euston and St Pancras is important because it achieves a lot more than linking HS2 to international trains. HS2, and other main line services at Euston could in addition be linked to the full range of services at St Pancras and Kings Cross, including Thameslink serving parts of south London and the Croydon – Gatwick – Brighton corridor and the Souh Eastern high speed services to Kent. The distance between the west side of St Pancras station and the East side of Euston is 500 meters, no more than many airport terminal walks and approaching in length some of the longest underground passageways on the Underground network, yet a walk between them via Euston Road nearly doubles that distance along crowded pavements, across a number of road crossings and clearly unprotected from the weather, Although it is possible to pick a shorter route through the back streets of Somers Town, that is perhaps not practical to find and negotiate for the casual or heavily encumbered transfer passenger. Crossrail 2 stations, especially the Euston – St. Pancras example are likely to follow the Crossrail 1 examples being built now consisting of two parallel deep tube platforms with two separate entrances linked to their their extremities. This can almost be thought of as two separate stations, as the entrances could easily be up to be around 500 metres apart on different streets. The use of such double ended stations for transfer between the entrances may not be practical however as this would require a passing through gates at one end, descending via escalator to platform level, perhaps passing at least part of the way along crowded platforms before then ascending to the surface again. 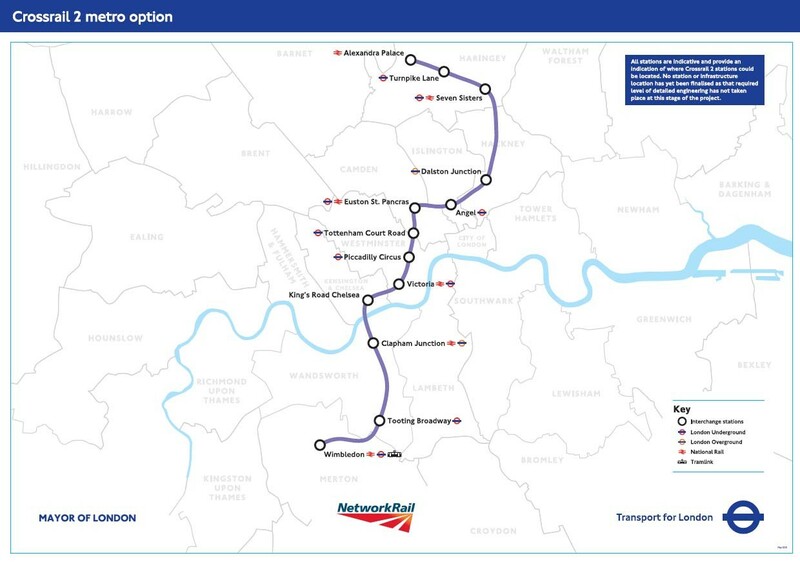 So whilst it is sensible to link Crossrail2 to both Euston and St Pancras, this will not, in itself, provide a realistic solution to transfer between them. The solution to inter-terminal transfer could entail an airport style shuttle transit system as previously investigated, but an elevated link through Somers Town could have major problems with visual intrusion, not only the impact on the streetscape itself, but also a raised link would overlook residential areas, perhaps affording its users with views into private flats and offices. That might force an entirely enclosed passageway making it even more unsightly. . . it might as well be underground. My north passage proposal offers a potential solution and envisages a shallow cut and cover subway taking a new alignment across Somers Town. My first attempt at illustrating this is here – http://www.townend.me/files/kxlink.pdf . This involves a two stage travelator ride linking in to a new additional Euston station entrance on that terminal’s eastern side incorporated into the rebuild and with subway access to all platforms. Further thought resulted in this – http://www.townend.me/files/north-passage.pdf . One of the travelator stages (nearest Euston) is now replaced by a naturally lit sunken covered arcade that effectively becomes the local street entrance to a new Euston east side station access, and could contain some retail, refreshment, some travel and ticket sales facilities, all aimed at the transiting passengers and paying some rent to help make a business case for the link. A 10m wide tunnelled 150m passageway containing moving walkways remains passing under Chalton and Ossulston Streets, which acts as a ‘cultural bridge’ allowing the day to day life of Sommerstown to continue unaffected over the transit route. That’s not to say the link is isolated from the local community with the arcade encouraging access via steps and lifts decending from the street level at multiple points along the length of Drummond Crescent , which would gain a commercial frontage with retail or similar units on the upper level above the units serving the basement walkway below. Also at the east end of the travelator passage there could be stairs leading directly to the east side pavement of Ossulston Street. One major concern over the existing Euston station complex and its future redeveloped replacement is the barrier it represents for east west local communications across Camden in the locality. The east – west subway under Euston in my proposals could help to open this axis up if the east side entrance was linked through the subway to a new matching west side entrance. Mark Townend has propsoed an interesting solution to the inter-station transit dilemma, although I can understand his 1st scheme rather better than his 2nd. I feared he has rather spoiled the argument by rather glibly observing that the Drummond Crescent site is available because “the school proposals might be more easily accommodated elsewhere nearby”. I think my colleagues in Camden will politely ask where exactly? The challenge of building a link between Euston and KX/St P is another example of strategic transport needs seemingly justifying destruction of another inner London community. Residents around Kings Cross have lived through one of these battles (and partially won). Just over 20 years ago it was planned to trash most of the streets east of Kings Cross rail station in order to build a station for what is now called HS1. The alternative plan worked out very much better. But it took intense debate and campaigning to stop transport engineers doing what they reckoned was the easiest and cheapest solution. The area of Somerstown between Chalton Street and Ossulston Street is a neighbourhood of high density affordable housing which is a distinct and long established community. Doubtless we shall soon hear those well-worn (and wearying) arguments about “regenerating” the area (demolishing hundreds of homes) and delivering “a better social mix” (shipping out low income families and importing affluent ones) as some kind of win-win solution to the problem of building a transit link between the mainline terminals. I am sure there is a practical way to build such a link but it needs to be done carefully. It needs to respect the fragile ecology of those estates, provide a new school if HS2 results in destruction of the area west of Euston doing so with minimum disruption. So let’s start off with a very sceptical view of anyone coming forward with a grand masterplan for the area promising “rejuvination” because in practice it will involve a fair dose of social cleansing. Lubricated doubtless by huge speculative opportunities for investors … which should be vigorously resisted.